Networking, networking, networking… As a business person, you understand how important it is to meet right people at the right place. We all are looking for opportunities, but how to know which is the one we need? Today data takes control of our lives. I mean, we do not belong to ourselves sometimes, because we do not want to loose a potential opportunity to network and to develop a business. Thus, as a result, we are running around from one event to another, getting exciting by making new contacts, new partnerships, and feeling uplifted. Does it really makes my business grow? How exactly will my business benefit from this new partnership? Am I focused enough on my strategic path while going to another event? Unfortunately, we do not always follow the necessary strict focus in order to benefit. We like meeting new people, listening to their business stories, making friends. But for all that you need to have a lot of time allocated, which is not the case for a really business person in our era of information overflow. In this regard, if you want to succeed and not only to grow your business, but keep it prosperous, you need to evaluate your TIME versus business BENEFIT. If the new contact/story/partnership is exciting, so interesting, absolutely out-of-the-box, but does not bring any benefit to your business, keep a contact, remember the story, but it’s better to focus on partnership and contacts that might be more beneficial. This is all about Priorities. Try not to mix everything in one box and remember that like strategy, priorities need to be flexible depending on the circumstances. There are different interpretations of ‘priorities’, I am not talking about priorities between personal-business, I am trying to underline one business priority over another business priority. Since your business strategy should be constantly re-evaluated in order to reflect external environment and internal development, so should your priorities. Constant evaluation, constant focus and constant re-consideration. 3. 81% admit that their growth initiatives lead to waste, at least some of the time. 4. 47% say their company’s way of creating value is not well understood by employee or customers. As was revealed by the survey, it is important to keep your Priority LIst simple and concise. 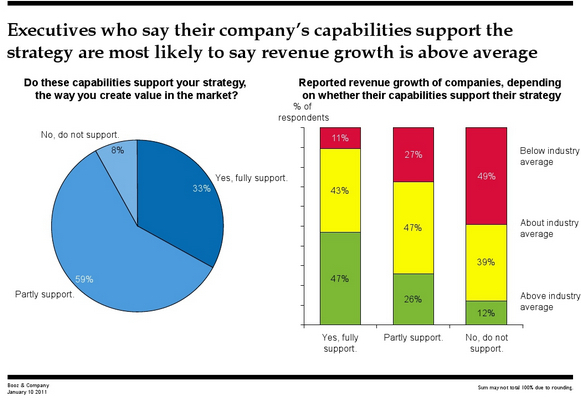 Below are some charts that show that executives with most focused set of strategic priorities were the most likely to say they had achieved above-average revenue growth. 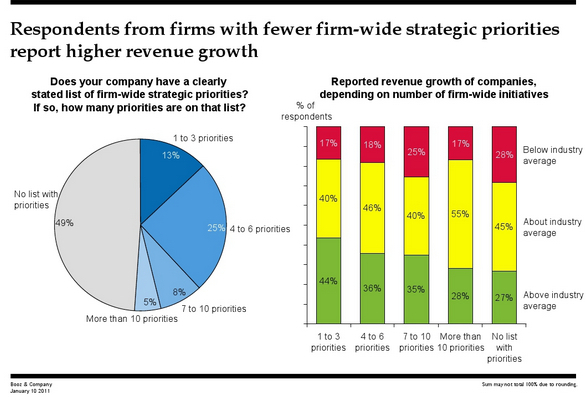 CEO Survey, Priorities vs. Growth, Booz & Co..
2. Force-rank the projects to determine what’s really important. It is necessary to make decision on what projects should be dropped or delayed so that the most critical projects get the focus and the resources they require. 3. Communicate to the rest of the organisation. Engage your employees, thus they can calibrate their efforts accordingly and be more productive. 3. Repeat the process periodically. Setting priorities is not just a one-time exercise and needs to be repeated and be flexible as your business strategy. These were some suggestions on Networking and Priorities, while on Data will be revealed in next post.